At first glance you might think that Freemake Music Box is a librarian/player along the lines of iTunes and Windows Media Player. You'd be wrong. Music Box (free) could care less about what you have on your hard drive. Instead it searches YouTube and presents you with it music and music videos that it finds based on the words, name, title, or phrase you type in the search box. Just type the search criteria into Freemake Music Box and listen and watch the resulting online music. Freemake Music Box doesn't really give any indication that the music is from YouTube, it merely presents it in a list and allows you to play it. There's also a video preview pane that displays any video that's related to the track you're playing. From that perspective, Music Box is a much nicer, simpler interface to YouTube music videos though you can't enlarge or full-screen the video. There's not much more to Freemake Music Box than I've described. It has the usual playback controls, and the ability to sort tracks by album, as well allowing you to add tracks to playlists for easy access later on. Freemake claims all the music is legal, which is debatable--but it is from a legitimate source and not an offshore repository of ripped music or some other iffy site that might introduce malware onto your machine. You can't save the music--only play it--so it is legal from that standpoint. (Another product from vendor Ellora Assets Corporation, Freemake Video Downloader, does download YouTube video.) Note that seeking can be slow, since the music and video are being streamed. Also, some video may be blocked from being played by embedded players such as the one used in Music Box. Probably the best aspect of Freemake Music Box is the box, as in black box, aspect. There are no ads or other distracting and influencing distractions to steer you in one direction or another. Type in a search phrase and as long as it's not a flat-out well-known artist or song name, you'll find some unusual stuff. If you've a bent towards the eclectic, it's a nice way to satisfy your lean. It's also a good way to find that song that you may only have a partial name for. 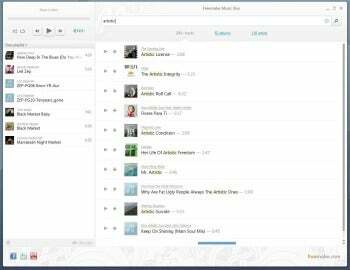 Music Box is a free and easy window to the world of online music and music videos.